Optical computing—using light rather than electricity to perform calculations—could pay dividends for both conventional computers and quantum computers, largely hypothetical devices that could perform some types of computations exponentially faster than classical computers. But optical computing requires light particles—photons—to modify each other's behavior, something they're naturally averse to doing: Two photons that collide in a vacuum simply pass through each other. In the latest issue of the journal Science, researchers at MIT's Research Laboratory of Electronics—together with colleagues at Harvard University and the Vienna University of Technology—describe the experimental realization of an optical switch that's controlled by a single photon, allowing light to govern the transmission of light. As such, it's the optical analog of a transistor, the fundamental component of a computing circuit. The heart of the switch is a pair of highly reflective mirrors. When the switch is on, an optical signal—a beam of light—can pass through both mirrors. When the switch is off, only about 20 percent of the light in the signal can get through. The paired mirrors constitute what's known as an optical resonator. "If you had just one mirror, all the light would come back," explains Vladan Vuleti?, the Lester Wolfe Professor of Physics at MIT, who led the new work. "When you have two mirrors, something very strange happens." Light can be thought of as particles—photons—but it can also be thought of as a wave—an electromagnetic field. Even though, on the particle description, photons are stopped by the first mirror, on the wave description, the electromagnetic field laps into the space between the mirrors. If the distance between the mirrors is precisely calibrated to the wavelength of the light, Vuleti? explains, "Basically, a very large field builds up inside the cavity that cancels the field coming back and goes in the forward direction." In other words, the mirrors become transparent to light of the right wavelength. In the RLE researchers' experiment, the cavity between the mirrors is filled with a gas of supercooled cesium atoms. Ordinarily, these atoms don't interfere with the light passing through the mirrors. But if a single "gate photon" is fired into their midst at a different angle, kicking just one electron of one atom into a higher energy state, it changes the physics of the cavity enough that light can no longer pass through it. Joining Vuleti? on the paper are lead author Wenlan Chen and Kristin M. Beck, both PhD students in his group; Robert Bücker of the Vienna University of Technology; and Michael Gullans, Mikhail D. Lukin and Haruka Tanji-Suzuki of Harvard. Of course, clouds of supercooled atoms are not a practical design for the transistors in, say, a Web server. "For the classical implementation, this is more of a proof-of-principle experiment showing how it could be done," Vuleti? says. "One could imagine implementing a similar device in solid state—for example, using impurity atoms inside an optical fiber or piece of solid." Primitive quantum computers have been built using laser-trapped ions and nuclear magnetic resonance, but it's hard to keep their bits—or "qubits," for quantum bits—in superposition. Superposition is much easier to preserve in photons, for exactly the same reason that it's hard to get photons to interact. The ability to switch an optical gate with a single photon opens the possibility of arrays of optical circuits, all of which are in superposition. "If the gate photon is there, the light gets reflected; if the gate photon is not there, the light gets transmitted," Vuleti? explains. "So if you were to put in a superposition state of the photon being there and not being there, then you would end up with a macroscopic superposition state of the light being transmitted and reflected." A photon-switched transistor has other implications for quantum computing. For instance, Vuleti? says, one of the first applications of a conventional transistor was to filter noise out of an electrical signal by feeding the transistor's output back into it. "Quantum feedback can cancel—to the extent allowed by quantum mechanics—quantum noise," Vuleti? says. "You can make quantum states that you wouldn't otherwise get." The switch could also be used as a photon detector: If a photon has struck the atoms, light won't pass through the cavity. "That means you have a device that can detect a photon without destroying it," Vuleti? says. "That doesn't exist today. It would have many applications in quantum information processing." "Energy consumption in computing devices is a big issue," says Jelena Vuckovic, a professor of electrical engineering at Stanford University. "The beauty of this approach is that it can really do switching at the single-photon level, so your losses are much smaller. You don't have to spend a lot of energy for each bit. Your bit is essentially included in a single photon." Vuckovic believes that it should be possible to reproduce the MIT researchers' results in physical systems that are easier to integrate into computer chips. "It's exactly the same story, except that instead of using these ultracold atoms in the cavity, you use a microscopic cavity on a semiconductor chip on a semiconductor and you use a quantum dot grown inside of the semiconductor as an artificial atom," she says. "There would be extra steps that people would have to take in order to implement the right energy-level structure. But in principle, the physics could be translated to a platform that could be cascaded and more easily integrated." 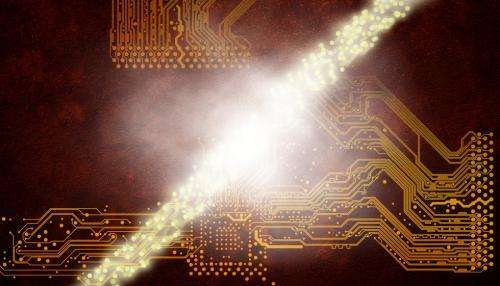 More information: "All-Optical Switch and Transistor Gated by One Stored Photon" This paper will be published online by the journal Science, at the Science Express website, on Thursday, 4 July. It seems that we know a lot about the behavior of photon, unfortunately we still could not understand what the photon is, how could it propagate without using any carrier? Maybe knowing its mechanism as below would help the research.